I am exhausted, y’all. After all the stress about moving and not getting much sleep lately, my Director of Publishing, Sam, and I hit the road to Wizard World Chicago Friday afternoon. This was my very first convention EVER, so I wasn’t totally sure what to expect. We checked into the hotel, hit the convention floor, went to dinner, met some of the people from Critical Hit, went out with them, and then crashed back at the hotel (thank Capt Mal for Uber and Lyft). After no sleep, we grabbed some coffee and hit the floor again. Anyway, Sam had a meeting with some WW big shots, so I hung out with my bff and her husband and got a glimpse of Bruce-freaking-Campbell being carted past us. He smiled and pointed and was generally just amazing. We ended up walking around the exhibitors to buy things I’d had my eye on the day before, and there were way too many booths selling the Funko Pop Vinyls. I LOVE those things–I have two on my desk at work–but was it totally necessary that ten different booths sell them? The handmade stuff was my favorite (as usual), although there were booths where I wanted All The Things. WoW Priest T5 robe? Yes. Tank top dresses of Star Wars characters? I’ll take them all. If you’ve never been to a comic con, there are SO MANY PEOPLE. I’ll be honest, though, it was pretty well run despite the sheer number of bodies in the convention center. Every hall had security directing traffic and checking for wristbands, announcements were made overhead for celebrity autograph and photo op times, and my bff directed me to some less-used escalators to avoid the near standstill at the main set (there was security trying to direct traffic there, too, but there were just too many people). Cosplayers EVERYWHERE, especially in the area right inside the main doors, and it made me wish that I’d cosplayed this year. If you want a picture with a specific character, THIS is the place to find them. 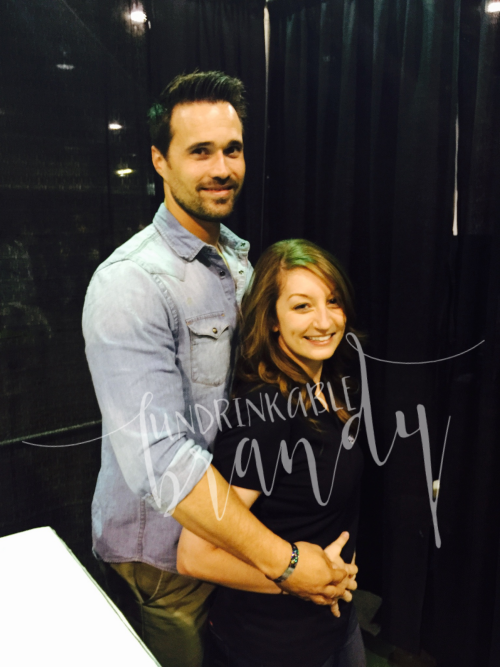 Heather, Dane, and I wandered around the photo op/autograph area and caught a glimpse of Brett Dalton (Grant Ward from Agents of SHIELD). I don’t fangirl over many celebrities, but y’all, Mr. Dalton is drop dead gorgeous. I ran over to the ticket line and bought a selfie ticket when I finally picked my jaw up off the floor. Heather and I got in line and ~heart eye emoji~ at him until we got up there. The two gentlemen in front of us were deaf and WW provided an interpreter for them, which I thought was totally cool. We watched the interaction (which we did with everyone anyway), and he kept his eyes on the two guys and was so focused on them and it was just awesome. When they went to leave, they signed “thank you” to him, and he signed it back. Y’all, I stand with Grant Ward. Then it was my turn. He smiled and shook my hand and said that it was nice to meet me. I told him I had a silly request and wanted a “prom photo” (since Heather got an amazing one with Bruce Campbell) and he was totally down. Even his “awkward prom date” face is handsome. (Someone else mentioned that this looked like a pregnancy announcement photo, which is even funnier.) By the way, having done both the autograph/selfie part and the photo op part, the first one is a much better deal. You actually have time to interact with the person, it’s less expensive, and if you bring a decent camera (and a second person to take the photo, though the volunteers will do it, too), it’s a much better experience. The photo ops are cool, but you’re shuttled into this room, throw your stuff down, take your picture, and leave without much interaction at all. Now, I told Sam that if I only got one thing from this trip, it would be to meet Nathan Fillion. That’s all I wanted. We’d met up with Dave a few times prior to this, and Sam mentioned that I wanted to meet Nathan, but it never seemed like it was going to happen. There were other celebs there, it really could have been anyone. 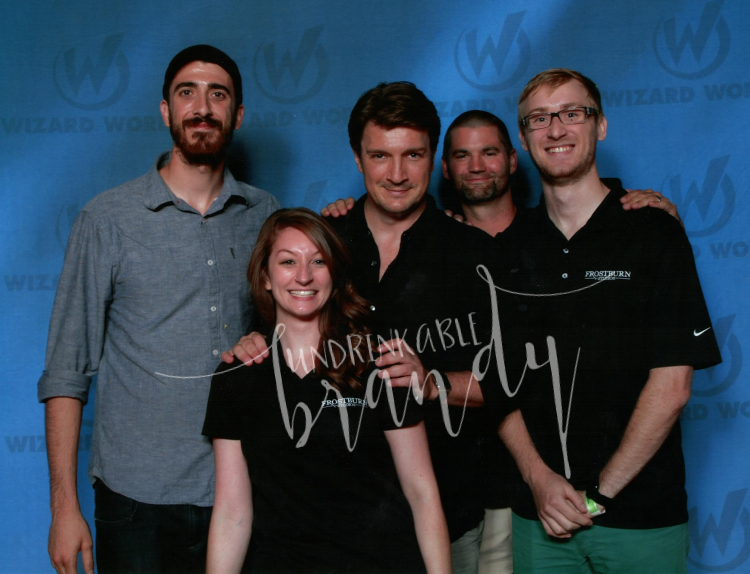 I was afraid that it wouldn’t be Nathan because we were supposed to meet at 3:30 and Nathan was in a panel until 3:45. At that point, I was tired and not looking forward to the almost three hour drive back home, but I ran upstairs with Sam to meet Dave and got ushered into a short line outside of one of the photo booth things (which I learned was the VIP line). There are no signs, which I feel like is kind of silly, but maybe they’re directing people at the entry area. So we’re standing there, wondering who the line is for, a girl comes by with her camera and says, “You have 45 seconds, go in, pose, go out the back, down this aisle, and your photo is printed down there.” I felt like an idiot asking who the line was for, so I kept my mouth shut. And then. There he was, walking up the walkway where we’d entered. Nathan is another celebrity who is extremely good-looking in person, and has this disarming smile. This is when I started fangirling. Hard. He disappeared behind the curtained area, and a few minutes later, our line moved. I looked up, and he’s in the booth we’re in line for. I almost cried. Sam had totally trolled me, he’d known the whole time and set this up. I wasn’t even mad. We get in, put our bags down, he shakes Adam’s hand and gets his name and then turns to me, takes my hand in both of his, gets my name, and mentions how happy I look. He grinned huge, greeted Sam and Jeremy, then put his hands on my shoulders and put me right in front of him and said that I NEEDED to be in front. So here’s the picture, I look like a total goober, but I was SO HAPPY. We left almost right after that (until we got down to our Lyft ride and I realized I’d misplaced my bag with my awesome pillow and badges in it…sigh–I did find it, though) to drive back home; thanks for waiting for me, Lyft driver. So all in all, best weekend ever. I’m gonna go sleep now.